Arpita wants to follow Jesus because of how Jesus saved her mother’s life. Watch the Mission Spotlight DVD or stream it online at bit.ly/missionspotlight to see how God is leading in the work in the Southern Asia Division and around the world. India is a family-centered culture. Often three generations live in the same house or in neighboring homes. Grandparents often care for children while parents work, either in the fields or in offices. Especially among Hindus, worship is generally observed in the home, where a room or a corner may contain statues of the family’s god or gods. This quarter’s Thirteenth Sabbath Offering will help strengthen the church in India to reach out to the billion people in India who have never heard the name of Jesus. Arpita’s [pronounced: ar-PEE-tah] life had a difficult beginning. Her father died when the ox cart that he was driving was hit by a truck. The shock of her father’s death caused her mother to give birth to Arpita early. Arpita spent the first few months of her life in the hospital with her mother, who couldn’t hear or speak. Both she and her mother were very sick. The doctors didn’t know what to do. The situation worried the rest of the family. Arpita’s family members were not Christians; they did not believe in Jesus. One relative, Arpita’s uncle Satish [pronounced: sah-TEESH], visited the hospital every day. He tried to encourage Arpita’s mother and make her smile. One Saturday, when Satish arrived at the hospital, he saw a stranger going from bed to bed. The man was praying with the patients. Curious, Satish approached the man and asked who he was. The man introduced himself as a Seventh-day Adventist pastor. Even though Satish did not believe in Jesus, he really wanted to help Arpita and her mother. So he asked the pastor to pray for them. The pastor gladly agreed. He prayed for the mother, and then he prayed for little Arpita. During the prayer Satish used sign language to interpret the pastor’s words to Arpita’s mother. The pastor visited mother and baby almost every day. He prayed for them every time he stopped by their bed. Soon mother and baby began to get well. Satish was amazed. He asked the pastor to tell him more about Jesus. The pastor studied the Bible with Satish, and then Satish used sign language to explain the Bible to Arpita’s mother. Several months later, both Satish and Arpita’s mother were baptized. Arpita’s mother immediately wanted to dedicate Arpita to the Lord. The pastor prayed a special prayer that Arpita would always be a faithful Christian. 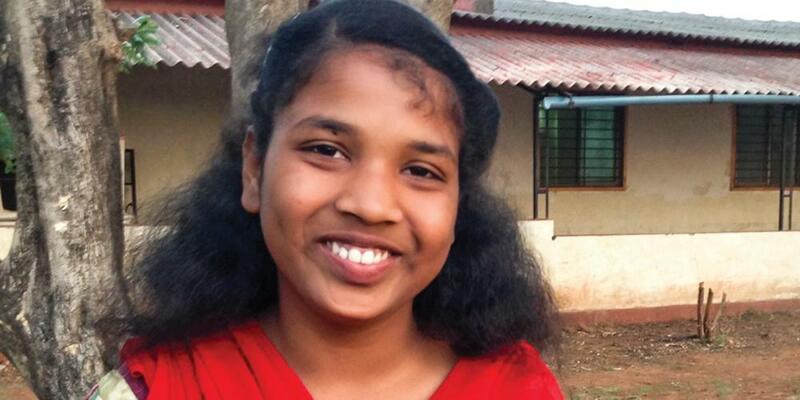 As soon as Arpita learned how to talk, her mother taught her to pray every evening at 7 o’clock. “Even now when I am far from home, every day at 7 o’clock I fold my hands and pray,” Arpita says. “I’ve been doing this for as long as I can remember.” Arpita is glad that the pastor stopped by her mother’s hospital bed to pray for them both. Now she knows how much God loves her—so much that He died for her! Recently Arpita followed Jesus’ example and was baptized. Arpita says, “I decided to be baptized because I’ve seen how Jesus has blessed my family through the Seventh-day Adventist Church.” She said she wants to follow Jesus because of how Jesus saved her mother’s life as well as her own. “I’ve seen what Jesus has done for us,” she continues. Arpita also thanks God that she is able to study in a the Alate Seventh-day Adventist School in western India. While her school is not well known and doesn’t have a large enrollment, the teachers still love the students and teach them how to follow God. And for this Arpita is doubly glad. Part of this quarter’s Thirteenth Sabbath Offering will help build 14 new classrooms at Arpita’s school. The new classrooms will allow more children to study at the Adventist school and receive the same hope as Arpita.